When my daughter was about 5 years old, she suddenly refused to eat mushrooms. I blame it all to my husband for calling them “fungus” over a dinner table one day. “Look what we got. Fungus for dinner!” I was serving some mushrooms on the side. He was not (and still is not) a mushroom guy. Ever since then my daughter tattooed the idea ‘mushroom = fungus = gross’ in her brain for the next 7 years. Not every fungus is created equal. Some fungus-es are bad, of course. But mushrooms (the edible kinds) are the good guys. Luckily my daughter grew out of her fear of eating the edible fungus. She enjoys them in many dishes now (Thanks to her mother’s countless efforts to feed her good food… :)). Fall is a great mushroom season. You will see several different variety of mushrooms in many stores. 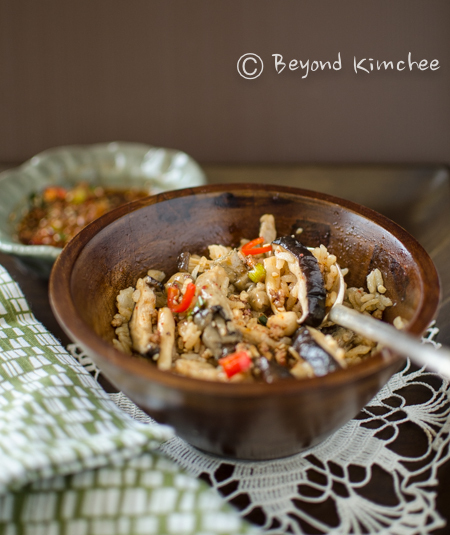 So grab a few package and make this simple Mushroom Rice Bowl with Meat Sauce. This is a simple one dish meal. So don’t be alarmed by the long list of ingredients. They can be put together lightening fast. You will savor the aroma of fall mushrooms from the moment you open the pot. 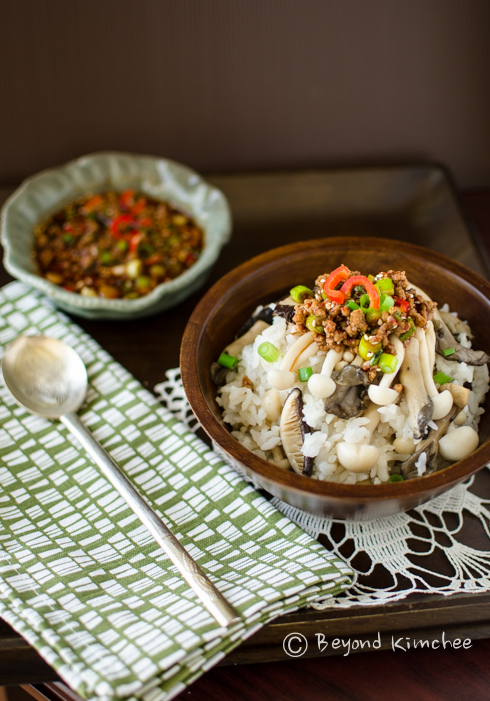 I used minced pork in the topping sauce but you can certainly use ground beef instead. 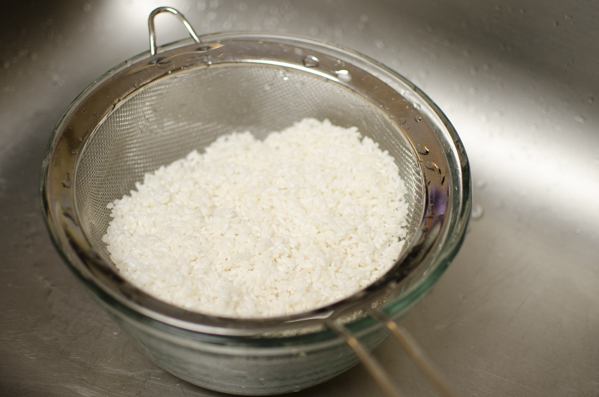 Rinse your rice (short grain) in water several times and drain well. Set aside. Here are my three mushroom amigos. 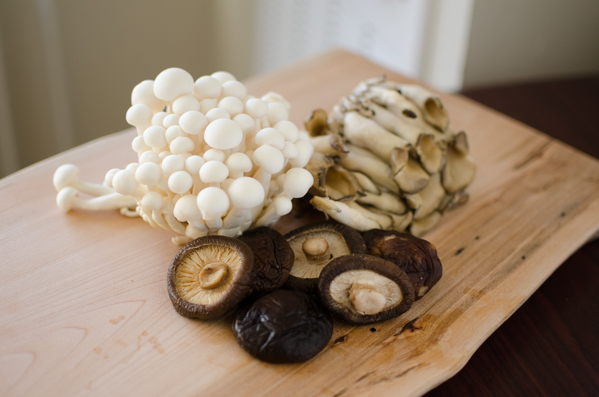 I used dried shiitake (soaked in water for 1 hour), oyster, and large enoki type mushrooms. I reserve the shiitake mushroom soaking water. You can use plain water instead. 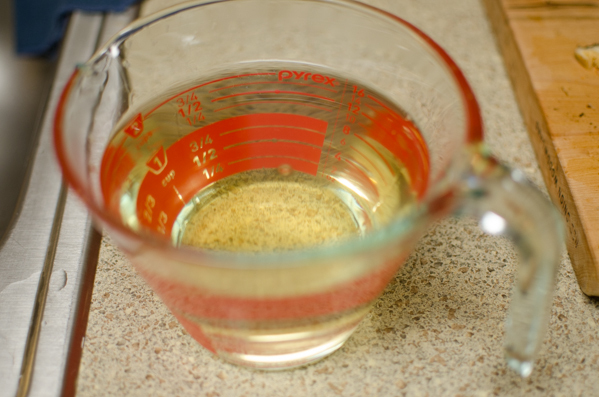 Heat a little oil in a heavy bottom pot over medium heat, toast the rice for couple of minutes. Pour the reserved mushroom soaking water (or plain water) and a large piece of dried sea kelp. 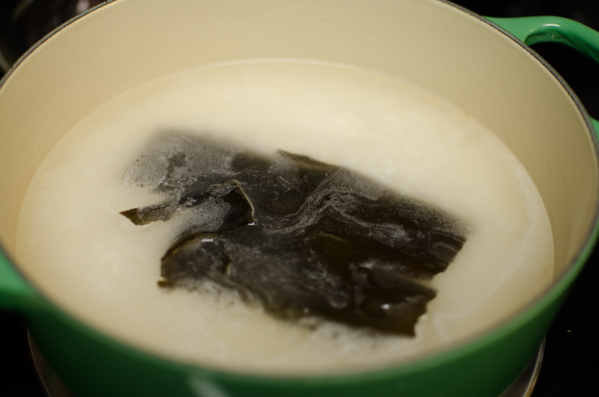 Koreans call it dashima, Japanese call it kombu. Anyway, bring them to boil. 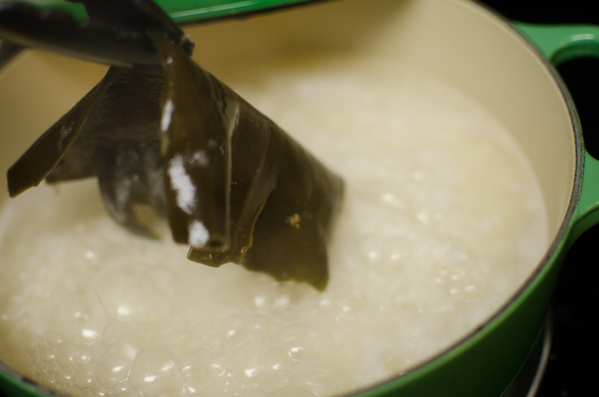 When it reaches to a full boil, remove the sea kelp and discard. Scatter the mushrooms over in the pot, cover with a lid, reduce the heat to low, and let the whole thing to simmer for 15 minutes. Then turn the heat off and let it rest for 5 minutes. 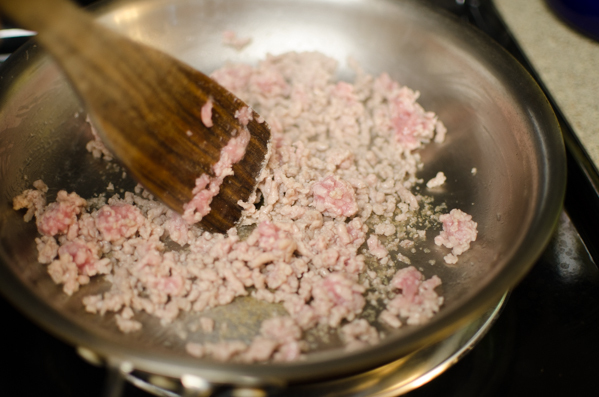 Meanwhile, cook ground pork or beef in a skillet until they are no longer in pink. 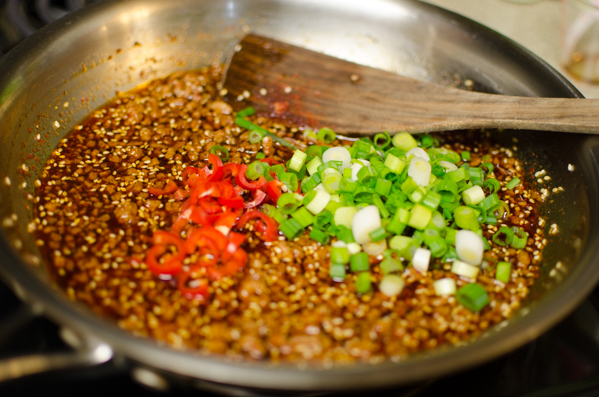 We are making the topping sauce to go with mushroom rice. Pour mushroom soaking water or plain water, and simmer until water is reduced a little. and the rest of the topping ingredients and let them simmer for 5 minutes. That’s all. This topping sauce is delicious enough to eat with just plain rice. Look! our mushroom amigo rice is done. Looking good! 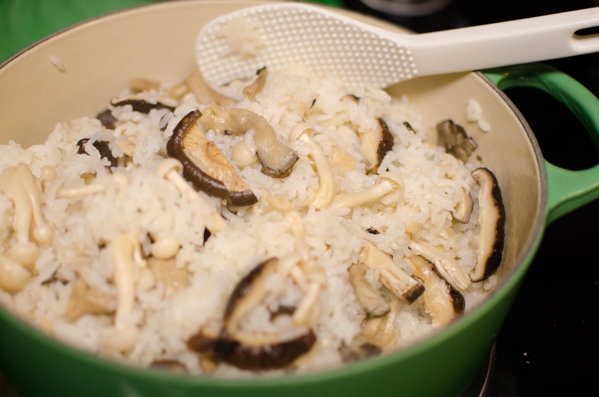 Gently toss the rice with mushrooms so they can get incorporated. Scoop the rice in a serving bowl and top with the meat sauce. Mix it up, folks!! You just got a delicious yet healthy meal in your hand. And you are supposed to give big thanks to all the fungus in the world. The culinary world would not be the same without them. 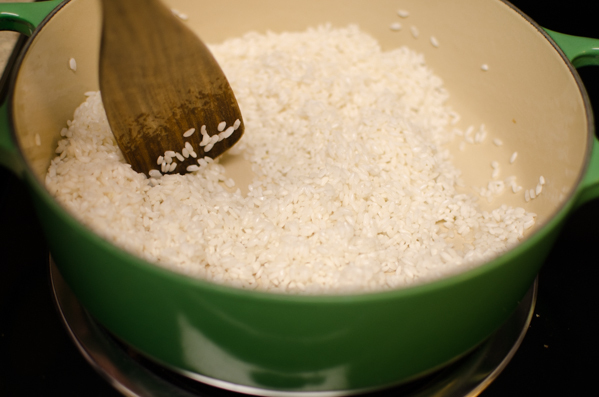 Make sure your rice is soaked at least 30 minutes and drained well. 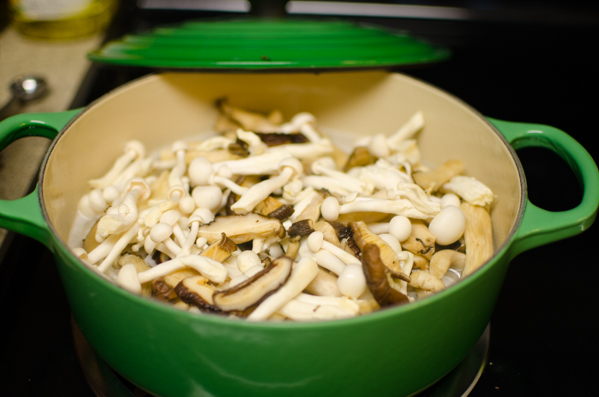 Take the shiitaki mushrooms out of its soaking water and squeeze out the excess water. Reserve 2.5 cups of the soaking water. Slice the shiitaki mushrooms into bite size pieces. Cut off the bottom end of other mushroom stems to remove dirt. Separate the mushrooms to bite size pieces. 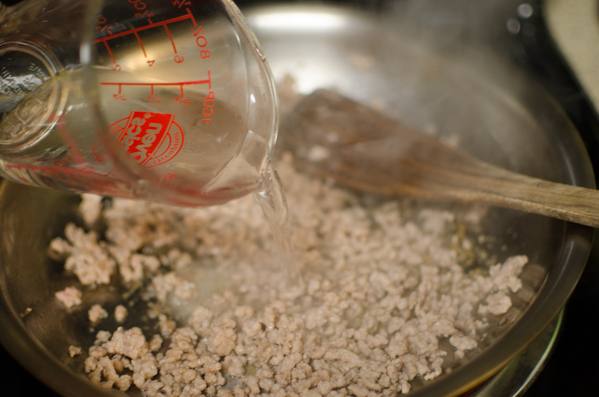 Heat oil in a pot over medium heat and put rice in. Toast rice until they are coated with oil, about 30 -60 seconds. Pour the reserved mushroom soaking water and the sea kelp. When the water boil and bubbles up, remove the sea kelp. Add the mushrooms and close the lid. Turn the heat down to low and simmer for 15-20 minutes. Turn off the heat and let the pot sit on the stove for 5 more minutes. 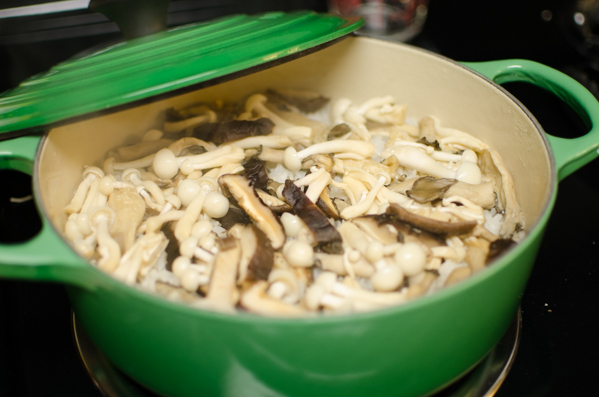 Open the lid and gently toss the rice and mushrooms together to incorporate. Serve warm with meat chili sauce to mix with. 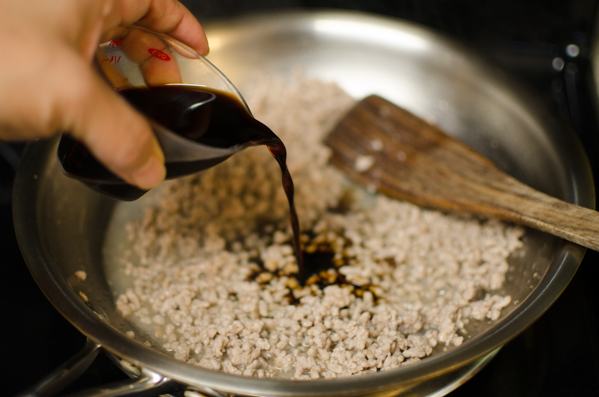 Brown the ground pork (or beef) with a little oil until no longer pink over a medium heat. Pour water and let it simmer until the water reduces to half. Turn off the heat. Add the rest of the ingredients and stir well. I love mushrooms! So you know this dish has my number. This looks so great - gotta try it! Thanks so much. I like how mushrooms are so meaty that you can almost fool yourself you're eating meat. And this dish certainly seems like it's a satisfying one. 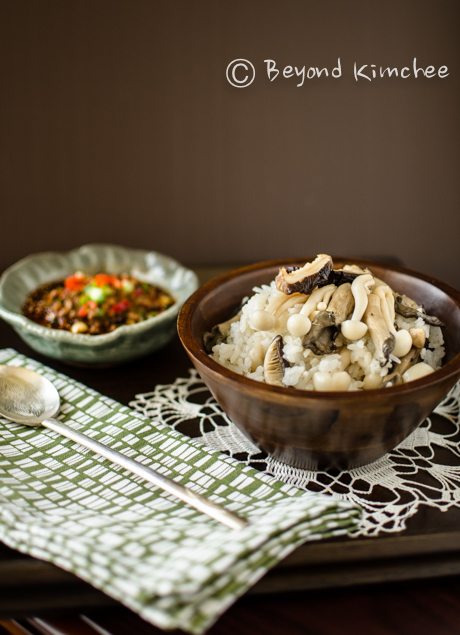 Is there any way to cook the mushrooms and rice in the rice cooker instead? Of course you can use rice cooker. Just omit the sea kelp and your are set to go. This is a great dish. Its delicious, quick and easy to prepare and healthy. I replace the meat for diced firm tofu coz I'm reducing my intake of meat and it still taste great. Thanks Holly. Thanks Butterfingers. I am glad to hear that you liked it. Tofu is a great substitute for the meat. Interesting, my daughter who is 5 started to refuse to eat mushrooms too. She was eating fine, but she started to complain about the flavor. 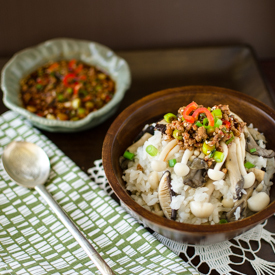 I need to make mushroom rice! I mix it up and hopefully she'll enjoy it. This looks so comforting and delicious! Hi I'm new to cooking. What kind of soy sauce did you use? Here we have salty one, sweet, light, dark, etc. I'm confused. Light soy sauce would be good. Thank you so much. I will have to try it soon. Another perfect recipe to change things up a bit! Every time I start getting bored with the dishes I make for the week, I visit your blog for some inspiration. Thanks for all your awesome recipes! That is so sweet of you, Soo. I appreciate your comment. I am so glad that my recipes provide some inspiration. Cooking is so much fun especially when you try something out of ordinary from your comfort zone. 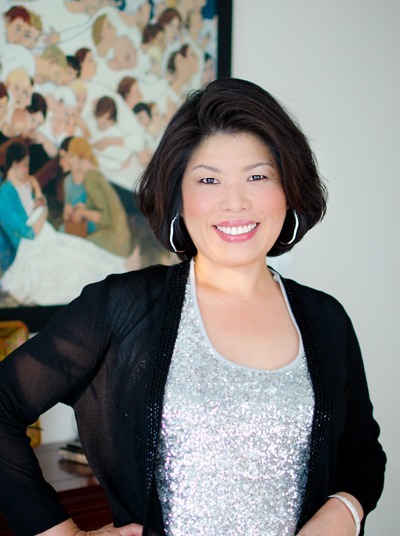 Hope you get to try many other dishes from my site. Cheers! I just made this~ so yummy! Thank you!! Thanks, J. Glad that you liked it. This is an amazing recipe!! My kids are crazy for it. Actually we are all crazy for it! I take whatever vegetables I have on hand and put a few sauteed or steamed veggies on top too. Adds a little more color and nutrition. 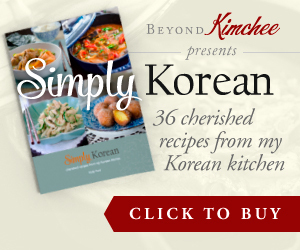 I also didn't have korean plum extract so I substituted pomegranate molasses. Came out great! !